Since we are avid readers (well we do open a book once in a while) we thought we should join in. Much to our delight, we discovered a book right up our alley! How thoughtful of Dr Seuss to write a book about Peaches! Down below, you'll see a different sort of celebration. Paprika, not realizing that the Dr Seuss hat which Ellen Pilch 15 and Meowing brought her last year was to be worn, is seen CARESSING the cardboard hat with her cheek & ears! Takes all kinds. Short 30 second vid.Thanks again, Ellen! Cool! We did not know the Cat in the Hat was Peaches! YAY FOR DR SEUSS DAY! Happy Dr. Seuss Day to you! 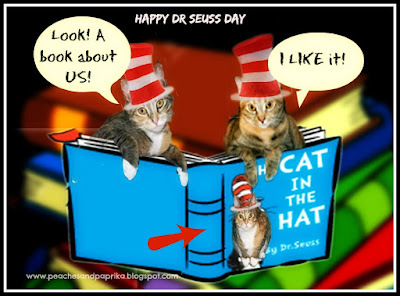 How lucky that Dr. Seuss wrote a book about you :) That is a cute video too! We love it! Happy Dr. Seuss Day! Happy Dr. Seuss Day! We loved hearing Paprika's purrs!!! Too cute! Happy Dr. Seuss Day! Dr Seuss is truly fun! Thank you for your post expressing sympathy to us for the loss of our dear Tabby. I really appreciate you taking the time to be supportive in this way!